I decided to do a review of Legend of the Bat because I wanted to talk about wuxia movies that gamers will appreciate. The director of the film, Yuen Chor*, was prolific, making 120 films in the first thirty years of his career. He was also a talented screen-writer and was responsible for greats like Intimate Confessions of a Chinese Courtesan and Killer Clans. The volume of his output and the kinds of stories he likes to tell, is reminiscent of what gamesters do. Legend of the Bat in particular resonates with that part of my brain that is always on the look-out for cool stuff to incorporate into my weekly campaign. Because it is a mystery, I will be vague on details in this review and try to capture the feel of the movie more than anything else. 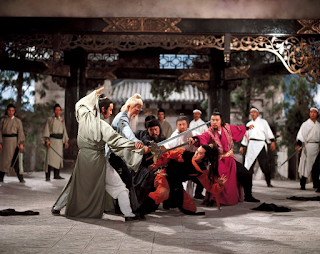 Legend of the Bat is a 1978 Shaw Brothers Film, directed by Yuen Chor and stars Ti Lung (Chu Liu-Hsiang), Derek Yee (Mr. Bat), Yueh Hua (Li Yuhan), Ching Li (Liu Yumin), and Candice Yu (Jin Lingzhi). Legend of the Bat is the second in a trilogy of films based on a book by Gu Long (Clans of Intrigue is the first film, Perils of the Sentimental Swordsman is the third). It helps to watch the first film but isn't necessary. I do recommend Clans of Intrigue, you simply don't need to watch it to understand the plot of Legend of the Bat. The core concept is fairly simple: a terrifying mastermind named Mr. Bat looms over the martial world from his residence on Bat Island and our hero must go there to confront him. A very simple idea, but the path is riddled with complexity and various twists that force the viewer to do a double-take. Some people don't like the confusion of these turns, but I delight in them. You'll understand better on a second viewing, however you really don't need to grasp the fine details to enjoy a movie like this. At its heart, this is a mystery and adventure story. It features plenty of martial arts, but what drives it forward is the investigation and cascade of clues and gorgeous set-pieces. It is a visually engaging movie and you can almost enjoy it for that alone on the first watch. The characters are colorful but the tone is dark. This comes through right away in the opening scene where an auction is taking place at Bat Island. 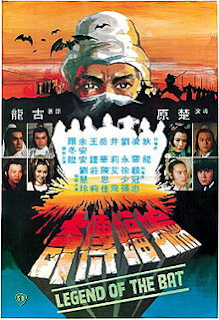 It seems people can try to obtain all kinds of things at this annual affair, and a mysterious bidder asks for the head of Chu Liu-Hsiang (Ti Lung). 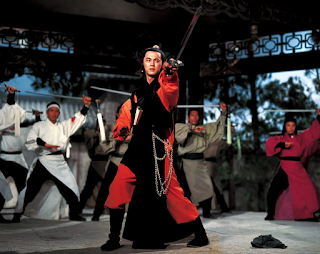 Chu Liu-Hsiang is an unrivaled martial hero, who travels with his friend Yi Tien-Hung. They are drawn into the mystery of Bat Island when they stumble upon the murdered bodies of other experts from the martial world at Siming Villa. There they meet a man who can't remember who he is but was clearly involved in whatever occurred. All he knows is he is supposed to get to Bat Island. This is an intriguing opening that immediately pulls you in. As the story unfolds similar leads appear, equally opaque and compelling. The two meet other heroes along the way, sometimes it is unclear if they are allies or enemies. Ultimately what propels Chu Liu-Hsiang to seek out the island for himself is when he meets Li Yuhan and Liu Yumin (Li Yuhan's ailing wife). Yumin is very sick and needs an opium-based remedy that Mr. Bat has access to. Chu Liu-Hsiang agrees to go the island to help obtain the medicine for her. The introduction of these characters is playfully inventive and I don't want to spoil it by going into too much detail. Just note that it is worth paying attention to. Later he teams up with others as well, like Jin Linghzhi (Candice Yu), a dutiful daughter trying to rescue her father from Bat Island. Jin Lingzhi's father was an engineer who helped design the complex on the Island but was forced to stay there against his will. There is also a royal guardsmen in the mix, but I can't say too much about him without giving away fun surprises. The journey to the island is a bit spellbinding due to the set-pieces. After an initial investigation Chu Liu-Hsiang and his allies find themselves on an enormous boat with secret passageways and sinister schemes. More murder mystery follows, and after a disaster at sea, they are rescued by a blind and kindly man named Yuan Suiwan (who has an even more impressive boat). On the island they face all kinds of deadly challenges, from prison cells suspended above pools of acid to deep and deadly caverns with flaming pits before they reach Bat Hall to confront Mr. Bat himself. I won't spoil the details of the mystery enshrouding the island but it is a cleverly executed, if somewhat foreseeable twist. Legend of the Bat is a well-paced mystery and adventure, with tons of gameable content. 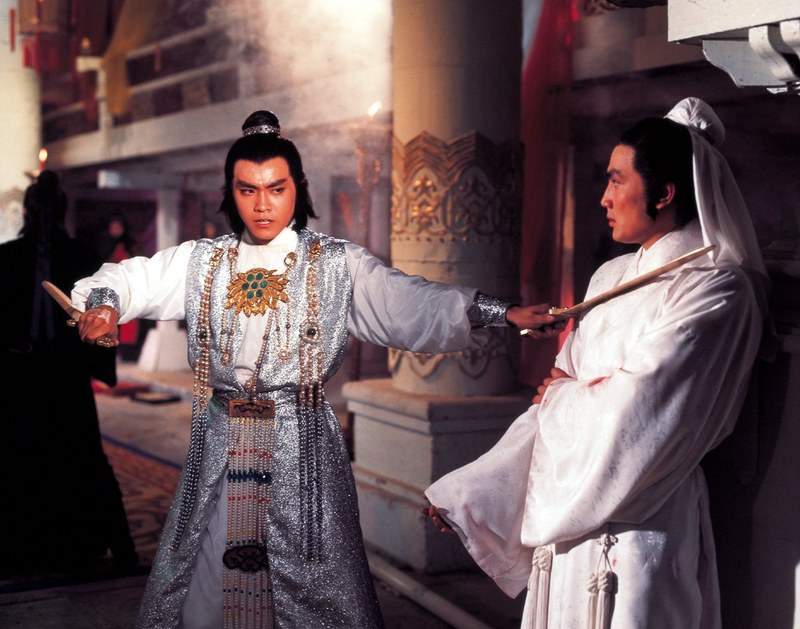 More than many other wuxia movies, Legend of the Bat illustrates how dungeons can feature in the genre. Much of the film takes place in a series of caverns that connect various chambers of Mr. Bat's lair. The heroes trek through dangerous pits of flaming oil and icy caves, puzzling their way through obstacles and traps. The film features one of the most bizarre and wonderful traps I've seen: a house on the water that detaches into boats, pulled into a walled hall by a rope. The final result is the hero charges into a house following clues, only to find himself sealed inside and drawn to a chamber where the eye-patch wearing Xiang Feitian awaits him. It is filled with stuff like this. The first portion of the movie occurs on a boat (two different boats actually). Both are maze like, replete with traps and carry mysterious guests whose motives and allegiances are unclear. There are a lot of characters in Legend of the Bat and they are all memorable. Wuxia movies with lots of characters can sometimes have trouble making each one distinct but I feel this movie does a good job giving each person a unique role that sets them apart from the others. This also helps because there are some moving sacrifices along the way and you really need to feel for the characters for that to work. One thing I loved are the investigative hooks. The ways parts of the mystery are introduced and the ways characters are introduced. It just always holds your curiosity and keeps you guessing. Again, I don't want to spoil too much, but these are all things I can see a GM pulling into a campaign. I highly recommend it for gamers looking for inspiration for wuxia or fantasy games. There is so much here the would work at the gaming table (everything from the mystery itself to Bat Island and the strange use of boats). And as a wuxia film it's a great movie to watch. *More often rendered Chu Yuan or Chor Yuen, I'm retaining this usage to keep consistent with my previous reviews.